Owing to PUA’s concern to provide better educational services for its students and employees, the English Language Centre (ELC) organized a three-day event with the British Council, Alexandria to promote courses and services that can help improve PUA students’ linguistics skills needed in the field of study and work. A large number of PUA students, from all disciplines, visited the British Council booth located in the plaza of the Social Studies and Humanities Building. This definitely proves PUA students’ keenness to develop their linguistic skills as well as their comprehensive awareness of the importance of IELTS exams. To better prepare yourself for the IELTS exam, visit PUA English Language Centre for more information about the IELTS preparation courses. A placement test takes place every Wednesday at 9:00 a.m.
Visit PUA English Language Centre to learn more about the IELTS exams as well as the free info sessions. The British Council Alexandria and the English Language Centre at Pharos University are pleased to announce that PUA is now an IELTS Examination Venue. You can register for the exam on the British Council website, and pay at the English Language Centre located on the first floor of the Social Studies and Humanities Building Room D133 or pay at the British Council. Once you register with Pharos University, you get the 5-hour workshop conducted in the British Council for free. ​If you want to learn more about IELTS and how to prepare for it, come attend the IELTS Information Session conducted in Pharos. Call us to reserve your seat. Attendance is for free. Hosting free intensive five-hour workshops for candidates who registered to take the exam; the workshops take place in the British Council in Pharos; Professional instructors from the British Council will give the 5 hours workshops. 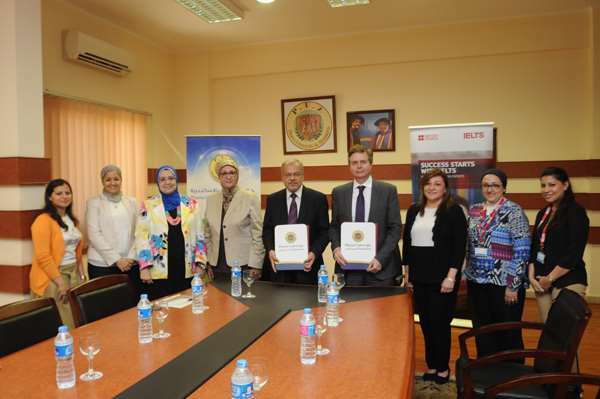 The British Council has signed partnership agreement with Pharos University in Alexandria. This collaboration will focus primarily on IELTS, with a monthly test session on the university campus from August onwards, potentially opening doors to more opportunities for their 12,000+ student base. The university sees this as a means to improving the English language capability of their students.